Hi folks! As you may know, the Scratch Team has been hard at work developing the next generation of Scratch, called Scratch 3.0, scheduled to launch in January 2019. Today, we are excited to share the Beta version of Scratch 3.0! The Beta version includes most of the features that we’re developing for the new Scratch 3.0 programming editor. It’s not yet connected to the online community, but it will be fully connected at the time of launch in January. The Beta version includes new and expanded libraries (sprites, backdrops, and sounds), new gradient tools, and the ability to connect to devices such as the LEGO Mindstorms EV3 and micro:bit. The Beta version also works on tablets! Between now and January, we will continue to fix bugs and improve the performance of the Scratch 3.0 Beta. 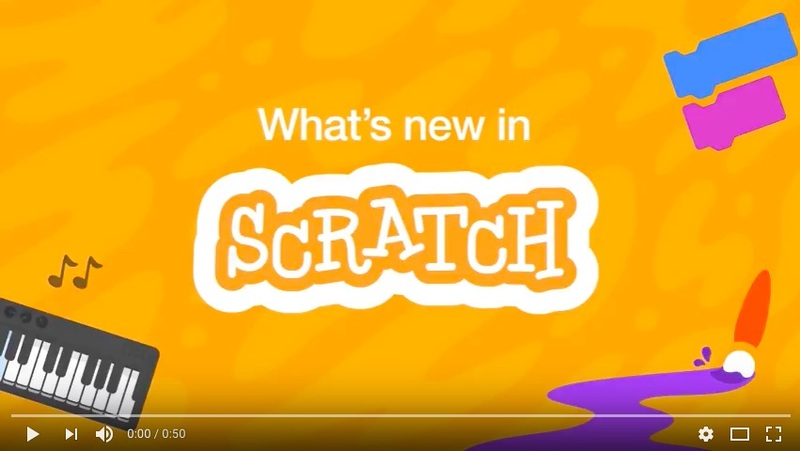 Scratch 3.0 will officially launch and connect to the Scratch online community in January 2019. When you make projects using the 3.0 Beta, you can save them to your computer and then share them to the community in January. During this Beta phase, the current Scratch online editor and community will continue to be available at scratch.mit.edu. To learn more about Scratch 3.0 and the Beta version, check out the Beta FAQ or see below. To join in with feedback or suggestions, please visit the Scratch 3.0 Beta forum section. Scratch 3.0 is the next generation of Scratch – designed to expand how, what, and where you can create with Scratch. It will include dozens of new sprites, a totally new sound editor, and many new programming blocks. And with Scratch 3.0, you’ll be able to create and play projects on your tablet, in addition to your laptop or desktop computer. When will Scratch 3.0 be integrated into the online community? We plan to launch Scratch 3.0 in January 2019. It will be fully integrated into the online community at that time. Will the Beta version change over time? Between now and January, we will continue to fix bugs and improve the performance of the Scratch 3.0 Beta. How is the Beta version different from the Preview version? Some of you may have already tried out the Preview version of Scratch 3.0 (preview.scratch.mit.edu). We opened up the Preview so Scratchers could try out the new version and share feedback as we developed it. The Beta incorporates some of the feedback we heard while working on the Preview, and we’re now ready to share with the entire community. Will my current Scratch projects still work on Scratch 3.0? Don’t worry, nearly all existing Scratch projects will continue to work in Scratch 3.0. In the Beta, there is an option to test out existing Scratch projects. When you go to the Beta, click on “View 2.0 Project”. If my project isn’t working in Scratch 3.0, what should I do? If you find a bug or your project isn’t working properly, press the “Give Feedback” button in the Beta programming editor. What changes are planned for the rest of the Scratch website? The Beta version focuses only on the programming editor, but we are also working on improvements to other parts of the Scratch website (especially the home and project pages). Existing community features will all be there – and all of your projects, profiles, studios, and comments will automatically transfer to the new Scratch 3.0 website when it launches. What are Scratch 3.0 extensions? In the Scratch 3.0 programming editor, you can add collections of extra blocks called “extensions.” For example, there will be extensions that enable you to program physical devices (such as micro:bit and LEGO robotics kits) and to translate text within your Scratch projects. We will continue to add new extensions over time, so what you can do with Scratch will continue to grow over time. Where are the pen blocks? And the play-note blocks? These blocks are now contained in Scratch extensions. To add them, click on the extensions button in the bottom left corner of the screen, and then select the extension that you want. It’s on the way! It will be included in the January 2019 release. Will Scratch 3.0 be available in multiple languages? Yes! The beta version is available in more than 40 languages, with many more on the way. Why has the stage moved to the right side of the editor? As we tested different prototypes of Scratch 3.0, people found the interface more intuitive and understandable with the blocks palette on the left and the stage on the right (with the scripting area in the middle). Fun fact: This setup is similar to the arrangement of Scratch 1.0, the original version of Scratch. Once Scratch 3.0 is officially released in January, where will I be able to find it? I try to be as respectful & helpful in Scratch forum as possible, i avoid using “Support” or “No Support” when i'm posting on suggestion forum, and i'm trying to make my posts as new scratcher friendly as possible by linking to an ITopic. I take care of necroposting, thread hijacks, etc. If you have any suggestions how to improve my posts and make my posts more helpful, be sure to click “Criticize my post” and leave a comment suggestion down below. Your feedbacks will help me to be more helpful in Scratch forum. How come I could use it yesterday on the 31st? I can't use it on Opera… Too bad. looks awesome! can there be a transparency option in the paint editor? so you can choose how transparent you want to make something? I should say that the new paint editor is awesome! Oh my goodness, this looks great! Although, I do have one problem: THE EDITOR IS TOO SMALL. Could you please put in mind of making that bigger? There's plenty of space for it to be expanded. Hi. I'm just a person who goes on Scratch every day. Nothing special here. New sound effects are awesome! Can someone provide some technical details on the Beta. Is it running without Flash? Has the file format changed? Will projects still work with Phosphorous? Is anyone else having issues with full-screen apps? Is someone tracking issues? How do we report issues? Does anyone notice stuttered animations? Do you see issues with variables displayed?